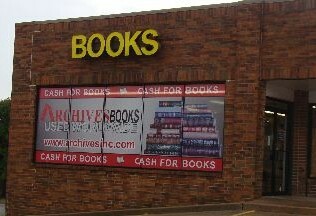 Archives Books, Inc., established in 1989 in Edmond, Oklahoma, is a pioneer of online book selling. We have been selling online since 1995 and are dedicated to providing the best prices with the most customer friendly service. With more than 2 million books sold, Archives Books remains committed to our unique customer satisfaction practices. We personally respond to every inquiry to ensure your buying experience is both enjoyable and hassle-free. We are also able to provide quality, low priced books worldwide through our advanced shipping systems. The book market is very competitive and we understand that service is what sets dealers apart. You can take comfort in knowing our customer service ratings are unmatched and your satisfaction is our only goal. Archives Books adds thousands of new titles each month and sells hundreds of books each day, so inventory is always changing and the selection is always different. What began in 1989 has turned out to be one of Oklahoma’s finest used bookstores and continues to be an excellent provider of used books worldwide. Our internet inventory is housed at our warehouse location in NW Oklahoma City which is not currently open to the public. If you would like to purchase anything from our online inventory, please email us with title and ISBN # and we can send the book up to our Edmond store located @ 1914 E. 2nd Street; minimum price for books for in-store pickup is $2.50 and delivery to Edmond store takes 2-3 days.